Government Affairs: OSHA silica dust rule one year later—are you complying? Last Sept. 23, the Occupational Safety and Health Administration (OSHA) silica dust rule went into effect. 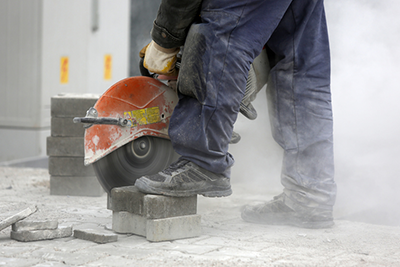 This regulation is designed to protect workers from exposure to excessive levels of airborne silica dust that comes from cutting, drilling, sanding or grinding concrete pavers, bricks, stone or other materials containing crystalline silica. The health effects of prolonged exposure to silica dust are severe and include silicosis, an incurable lung disease that can lead to disability and death; lung cancer; chronic obstructive pulmonary disease (COPD); and kidney disease. If you haven’t yet been visited by OSHA, review this article and be sure to comply to avoid fines and protect your workers’ health. OSHA gives employers the choice of one of two methods for complying with the standard in a construction setting by either using an “engineering method” or by monitoring actual worker exposure. For landscape contractors, using the engineering method will provide the most practical approach to controlling silica dust on the worksite and following the silica regulation. Most landscape contractors will be familiar with the engineering control methods, since many contractors were using them before the OSHA silica rules went into place. They typically will involve using wet methods to cut, drill or grind silica-containing materials or using a vacuum system to remove silica dust at the point it’s created. OSHA applies the standard according to the specific task and equipment being used. For each task, there is a specific engineering control method recommended for that piece of equipment. See Table 1 on this page of the regulations for OSHA’s guidance for each task and its engineering and work practice control methods. In addition, OSHA has created helpful fact sheets outlining the specific control measures required for each task in an easily printable form. Some common tasks and equipment used by landscape contractors are listed below with links to the pamphlet for that task. Stationary masonry saws fact sheet. In addition to the compliance measures outlined above, the rule requires several other measures of employers. Employers are required to make and keep accurate records of air monitoring data and objective data used to assess employee exposures to respirable crystalline silica under the standard, as well as records of medical surveillance provided under the standard. OSHA has published a booklet for employers that helps explain the requirements of the silica rule that is easier to read than the regulations themselves. You may download it here.